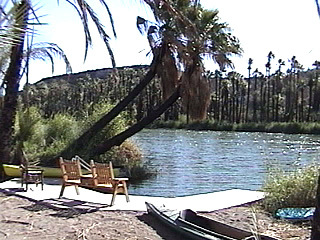 Ignacio Springs Bed & Breakfast is a Canadian owned and operated B & B located on the Rio San Ignacio in a beautiful palm grove 400 meters off the Transpeninsular #1 highway at San Ignacio, Baja California Sur, Mexico. Stay 7 nights for the price of 6! We have 8 yurts, 2 small block houses and one palapa casa. The yurts are individual round casitas designed on the Mongolian portable housing used by the nomadic people. All prices are for one or two people and include a full breakfast in the morning as well as the use of the kayaks and boats on the river. All units have air conditioners, microwaves or kettles. All units have their own patios and there are communal use areas at the river. Prices include the 11% federal tax and the 3% hospitality tax. A deposit of 50% is required to secure all reservations. -We have a 16' yurt with a king bed that shares the central bathrooms. This one rents for $65 including tax. -The 16' yurt that overlooks the river has a queen bed and a futon double that can be made up if a second bed is required. It has an en-suite bathroom and rents for $100. -We also have a very special 16' yurt with it's own bathroom and a comfy queen bed that will make you feel like you are in Africa. This one rents for $87. -The 24' yurt is very popular for groups that don't want to share beds, or families. This one has a few more amenities and is very comfortable for longer stays. It has 2 queen beds and a double as well as space for extra cots. This unit shares the central bathrooms as well. The price is $75.00 dollars with tax. There is an additional person charge. -The Palapa Casa is right next to the river and has a queen bed and it's own bathroom. The price for this one is $80.00 with tax. -A good family option is our small casita, which has two bedrooms and a bathroom. One room has a queen bed and the other has a double and a twin bed. It also has a table and chairs and a microwave. The cost for the first one or two people is $87.00. -Fall of 2006 brought about the addition of "La Muralla" to our rental line-up. This is a small house with a little sitting room, a huge bedroom with 2 queen beds and a hide-a-bed, plus a nice bathroom. This one rents for $87.00 dollars for one or two people. -July of 2007 brought about our top of the line China Wall yurt. This is a 24' yurt with the bathroom inside, a king bed and nice sitting area, private patio with access to a hidden little beach area. Very cool and comfortable! The price is $125.00 dollars taxes included. -Additional person charges are as follows: (6 and under are free) 7-12 years are $10.00 ($11.40 with tax) dollars each. 13 years and over are $15.00 ($17.10) dollars each. Cancellation Policy: For reservations made for the months of May through November, and canceled more than 30 days prior, a $25.00 dollar per room fee applies. For reservations canceled within 30 days prior, you will lose your 50% deposit for the first night. For cancellations 3 days or less prior, the penalty is the full cost of your first night plus your 50% deposit on the balance of your canceled days, plus tax. For reservations made for during the holidays, our Fiesta Tradicional, the Baja 1000 and whale season, your deposit is non-refundable and you may be liable for the whole amount of the cancellation. Special consideration may be given in special circumstances.